At StorQuest Self Storage in Modesto, we’re more show than tell, especially when it comes to our features. We offer gate access seven days a week and office hours Monday through Friday 8:00am to 6:00pm, and 8:00am to 5:00pm on Saturday and Sunday. Our office is a great place to load up on boxes, locks, and packing supplies. Don’t have time to visit our office to pay your rent? Not to worry, we offer online bill pay for your convenience. 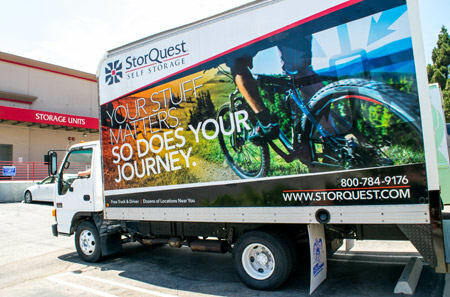 What else should you know about StorQuest Self Storage? Our facility is monitored by a 24-hour digital surveillance system and features electronic gate access. You can also count on our property to be well-lit and well-maintained at all times. Our number one feature is the FREE truck and driver we provide at move-in. We offer individuals and businesses ​residing within 15 miles of our facility this exclusive perk. All you have to do is call to set up the appointment and we’ll do the rest. Not only does this program save you time, energy, and stress, but also money! Why waste gas making multiple trips to your new storage unit when we can do it for you? To learn more about the features offered at StorQuest Self Storage in Modesto, contact our leasing office today.